Is there an Online Masters Degree for Personal Trainers? The National Academy of Sports Medicine which as been providing personal training certifications for years. The NASM has also sponsored an online masters degree designed for personal trainer and other professionals. Professionals include many health, wellness and training professionals ranging from military personnel to athletic trainers to chiropractors to coaches and of course personal fitness trainers. The online masters degree works very well for working professionals. 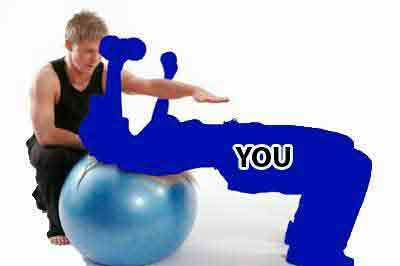 The course work is relevant and very useful for a working personal trainer. 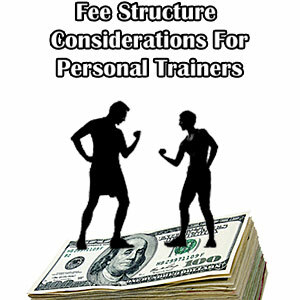 Much of the curriculum can be implemented immediately by the personal trainer. The knowledge learned is very helpful for improving the quality of service for a personal trainer. 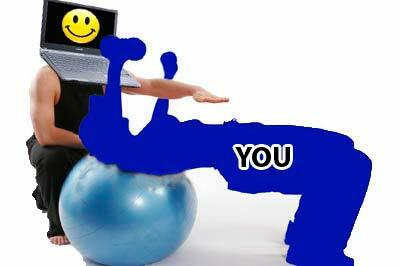 What School is the Online Masters Degree for Personal Trainers Available ? California University of Pennsylvania or Cal U was founded in 1852 and has been a member of the Pennsylvania State System of Higher Education since then. The online masters has been offered worldwide since 2003. The online masters program from Cal U is closely associated with the National Academy of Sports Medicine. During the online masters degree program a relevant certification from the NASM is obtained. What are College Degree Online Classes for Personal Trainers Like ? 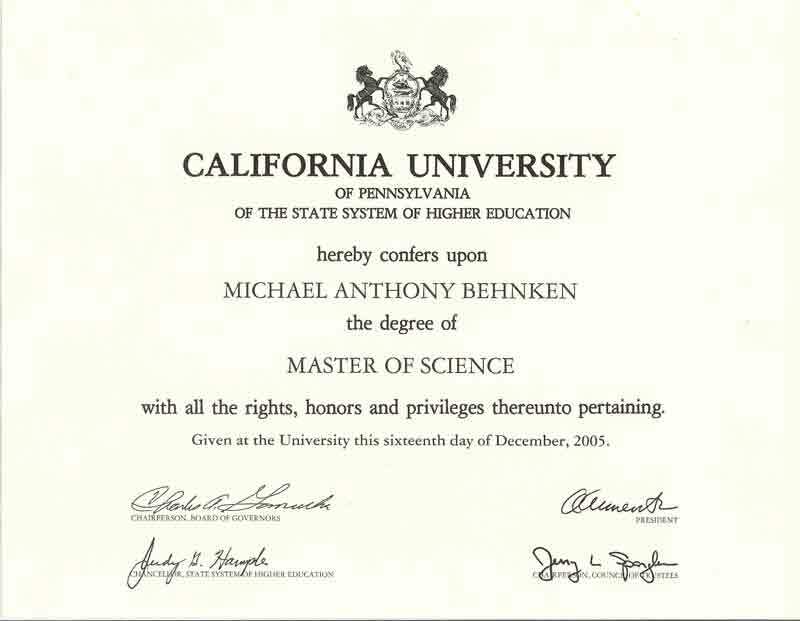 The founder of AskTheTrainer.com Michael Behnken, MS, NASM-CPT-PES, CSCS received his Master of Science degree in exercise science, performance enhancement, injury prevention online. According to Mike, his online college degree was the perfect solution for increasing knowledge while working full time as a personal trainer. His online master’s degree was a valuable tool to dramatically improve his knowledge of exercise science which had a direct correlation to the improvement of his personal training service. Since Mike already had 4 years of personal training experience, as well as an on-campus bachelor of science in exercise science, fitness program management and personal training certifications the base of knowledge was already there. What are the Different Degree Focuses for the Online Masters for Personal Trainers ? Here are the descriptions straight from the NASM and Cal U official websites. There are 4 separate tracks which allow a professional to focus on a field closest to their profession. Research and current issues in musculoskeletal rehabilitation and biomechanical assessment will be the focus of the courses. Students enrolled in this track are prepared to take the National Academy of Sports Medicine (NASM) Corrective Exercise Specialist (NASM-CES) certification. Students who have previously completed the NASM-PES advanced specialization will receive 3 university credits toward graduate requirements. Designed for the health and fitness professional, personal trainer, educator, military professional, coach, and others who want to learn about performance and fitness training program design for athletes and other physically active people. Research and current issues in sport performance training and injury prevention will be a focus of the courses. Students enrolled in this track are prepared to take the National Academy of Sports Medicine (NASM) Performance Enhancement Specialist (NASM-PES) advanced specialization. Designed for the health and fitness professional, personal trainer, educator, military professional, coach, and others who want to learn about fitness training program design and wellness programs for the general population. Research and current issues in the fitness industry, as well as wellness programs, will be a focus of the courses. Students enrolled in this track are prepared to take the National Academy of Sports Medicine (NASM) Certified Personal Trainer (NASM-CPT) certification. Students whom already are NASM-CPT certified will receive 3 university credits toward graduate requirements. The Sports Psychology track is designed for the coach, trainer, health and fitness professional, teacher, youth coach, and anyone else who has an interest in psychology related to sports, injury and fitness. Research, current issues, and applied techniques in sport psychology will be the focus of the courses. Can the Online Masters Degree from the NASM improve a Personal Trainers Career ? A masters degree from NASM is one of the few ways to truly become a better personal trainer. Your personality and experience will go the furthest to determine whether or not you will become a successful personal trainer. If you want the most in-depth knowledge about exercise science which will help your present and/or future clients, a college degree gives you that as well as extra credibility.